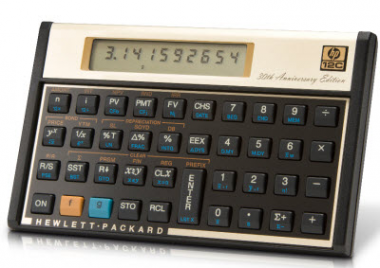 The first hardware conceived and delivered under HP’s ever popular CEO Léo Apotheker is an absolutely incredible calculator – destined to be a classic. I already have three of them! I bought one in 1983, the other two I quite literally inherited. The HP12C (30th anniversary edition) will soon be available for $79.99 (includes fancy gift box). Don’t confuse it with the Platinum Anniversary model (25 anniversary edition) which are still on sale. The HP12C is without question the best financial calculator ever made – the mark of a true financial professional. I’m no such professional – but I have three anyway. I also bought one for my Android Phone (RPNCalc Financial) – and used to have one on my DOS PC (Xact shareware). People freak-out about reverse polish notation (RPN), but it actually makes intuitive sense. There is some learning, but it is mostly unlearning a silly system. Conventional calculators (with their equals and parentheses keys) match what we read, but not how we think. Traditional calculators make you hit equals to get the result – equals is not a mathematical function! Compared to conventional calculators, RPN is always less or equal keystrokes. The 12C combines RPN with powerful financial functions. I also have a 15C scientific, and 16C programmer model. Thirty years! Financial math hasn’t changed much in 30 years, clearly the design, features, and size of the 12C was a winning combination. There has been a lot changes in the world. For example, 30 years ago HP was a highly respected company. Every engineering student wanted to work at HP, and not just because HP frequently picked college towns for their offices. I hope Apotheker gets his own 12C. It could be useful for tracking the devaluation of its PC business by declaring it for sale. The 12C has a 10 digit display (billion) which is bigger than most calculators, not quite big enough to track losses associated with WebOS (hint: use the EEX key for scientific notation). The 12C also does fractions and has a reciprocal key – great for tracking HPQ performance. The 12C really is impressive. If you have doubts, name another consumer electronic item that is still selling strong (without any change other than engraving) for 30 years. It is programmable, understands dates, and can do basic statistics. I use few of the advanced features any more, but still prefer it over common calculators (ah, an equals key, how cute). HP making more 12Cs was a sound financial decision, certainly better than making more WebOS tablets. Adding fancy engraving and the decorative gift box was pure genius – and they say innovation is dead at HP – yeah right! Actually, the fancy gift box and engraving makes me a bit nervous – is HP going to announce it is going to exit the calculator business? All the signs are there, a production run, new marketing, a respected product. As much as I recommend the 12C, you may want to wait for a potential blow out sale. RPN calculators do not have keys for all clear, parenthesis, or equals. I would do this problem starting within the parenthesis, but I showed left to right as well. Same number of keystrokes (10). I assumed an algebraic traditional calculator with parentheses keys. Didn’t bother with a square key in either example. Since the traditional calculator will require All Clear (AC) to start (RPN does not), brings total keystrokes to 13.